The University of Minnesota received a three-year $1.75 million grant from the National Science Foundation on Oct. 5 to study the potential impact of fully autonomous vehicles on community “health, equity, livability, and prosperity” or HELP, with the Minnesota Department of Transportation tagged to be one of its “partners” in its research effort. “The research will draw on innovative mobility field experiments underway in the Twin Cities region and will collaborate with several public, private and civil society partners,” noted Tom Fisher, a professor of urban design and a Center for Transportation Studies scholar, in a statement. 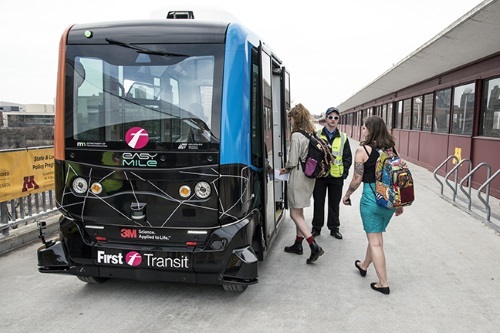 “These partners will include the cities of Minneapolis and St. Paul, the Destination Medical Center in Rochester, and the Minnesota DOT, the Metropolitan Council, and Metro Transit to design, plan, and analyze a shared autonomous vehicle system for greater community health, equity, livability, and prosperity,” he added. Zhi-Li Zhang, a professor of computer science and engineering who is the lead researcher on the grant, said this research project will result in policy recommendations, design guidelines, and quantifiable information on the potential uses of autonomous vehicles and also envisions the creation of a “smart cloud commuting system” based on giant pools of data shared via self-driving vehicle operations. “These smart cloud community systems have the potential to bring about far-reaching societal changes,” he explained, and would also provide more modal “equity” among local population groups as well as boost economic productivity.